I expect you are starting to think about Christmas! Well if you wanted to make some little creatures with Christmas hats here’s a quick tutorial to help you. You can find my free tutorial to make the little sleeping cats like the one shown on my blog here. 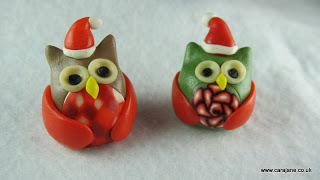 Of course any animal could become a Christmas animal with a little Santa hat not just cats – the owls love them! Test the hat for size, this was a little big so I chopped a bit of clay off and rerolled it into a slightly smaller cone. Roll a very thin log of white clay – moving your fingers out towards the end as you roll will help the log spread out and get thinner. Roll an even tinier ball of white clay to be a pom pom on the end of the hat. I poke a hole into it so that I can push the red point of the hat into it and then firm it gently in place so that it will stick to the hat but still be round. Put the hat on your creature and bend it over if you wish – I like them like that myself but you can off course leave it sticking up. Your sleeping cat is now a lovely little Christmasy ornament. A lovely gift for a friend who likes cats! Or add a hole and something to hang your cat (I used tiger tail and crimped it underneath the cat) and you have a unique and special tree decoration. The head end of the cat is lighter so I make the hole slightly nearer to the tail end rather than in the middle. If you’ve got any questions please do get in touch. I love to get comments on my blogs – or emails! If you haven’t already found me on facebook I have a page there and I’d love to see you there too. Hope all your Christmas Preparations go smoothly!